NLM Quiz no. 14: What is this? 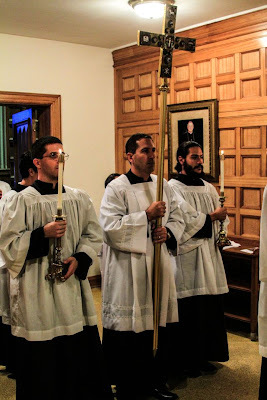 I am pleased to announce that Dominican Liturgy Publications has reprinted the section of the Dominican Gradual that contains what is traditionally called the Kyriale, that is, the chant settings for the Ordinary of the Mass. These seven settings are the authentic medieval Dominican ones and different in their selection and melodies (when there are parallels) from the modern Roman set of Ordinaries. This booklet makes a good companion to our previously published Dominican Rite Mass pew booklet, which contains only the music of Roman Mass VIII "De Angelis." There are other publications at Dominican Liturgy Publications that might also interest our readers. 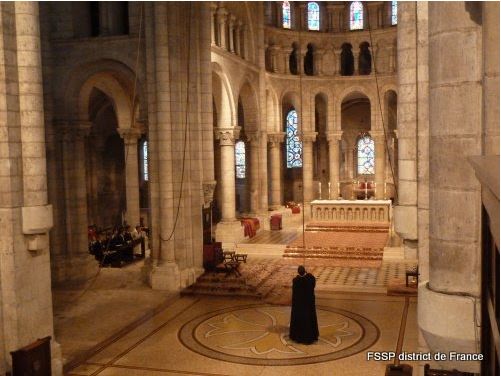 We haven't shown photos from Fr. Christopher Phillips parish of Our Lady of the Atonement in San Antonio, Texas for some time. Our Lady of the Atonement is of course one of the parishes of the Pastoral Provision (as distinct from the Ordinariate but who likewise enjoy a liturgical and ecclesial life as defined by the Anglican patrimony). They share some photos of a "Latin Mass" (I would suggest according to the Ordinary Form) which was recently offered there for the Feast of St. Matthew. Here are a few of the photos. The culture is a an expression of the core priorities, beliefs and values of a society. This expression is not so much articulated by a governing body that dictates it (the European Union is attempting to be an exception); it is more the aggregated effect of all the personal relationships and networks of personal engagements that comprise it. This means, I believe, that locally based networks of people should be a significant part of our thinking when we consider how to transform the culture. Not long ago I highlighted the Institute of Catholic Culture, which operates within a cluster of about 10 parishes, as one model for such a grassroots organisation. Here is another locally based organisation. This one operates throughout a diocese under the approval of its bishop - the Fra Angelico Institute for Sacred Arts. 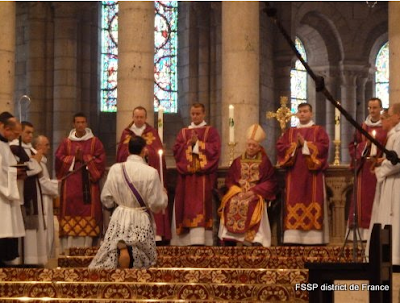 In 2010 the institute received approval from the Bishop of the Diocese of Providence, Rhode Island. It operates through the parish of its founders, Deacon Paul and Jacqui Iacono. 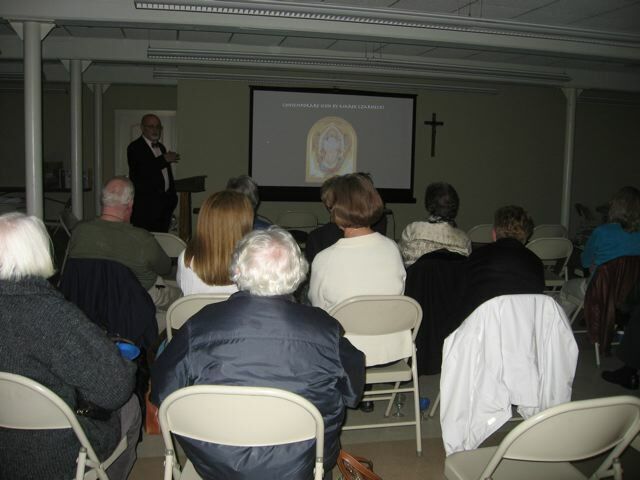 It offers lectures on all aspects of the culture and workshops in icon painting. It attracts from 40 - 100 people to its talks on a regular basis. It has a blog which is attracting interest. Although the organisational model is not identical and its scope is much narrower (this has a much tighter focus on sacred art), it has certain things in common with the Institute in Virginia that seem to me to contribute to its success. 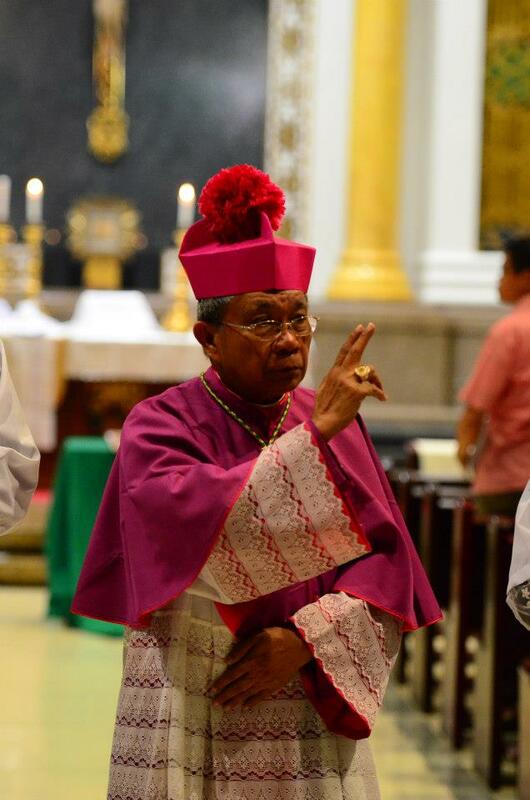 At its core it has knowledgeable and energetic people (both coincidentally have deacons of the Church at the helm). There is a grassroots enthusiasm generated by the instigators who transmit their knowledge and engage people personally, and who in turn can contribute to it. 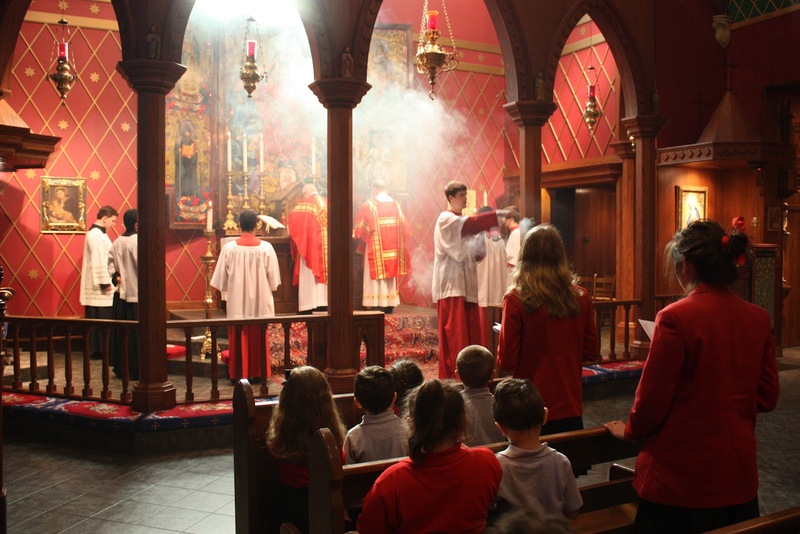 Both place a strong emphasis on the connection between liturgy and culture and create a local learning community through this. This devotional magazine will be published 6 times a year (7 times in our first year of publication), beginning with the Advent 2012 issue. Each issue features daily Mass propers for the Extraordinary Form of the Roman Catholic Mass (1962 Missal), daily meditations, explanatory essays, commentaries by saints and the Church Fathers, and devotional writings by priests, religious, and laity, as well as the Ordinary of the Mass in Latin and English. 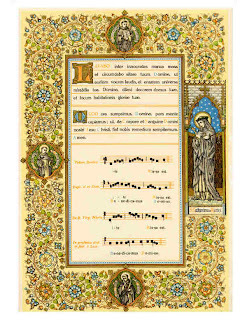 Laudamus Te is especially designed with an easy to use format to help newcomers learn to pray the ancient Mass without the confusion of navigating a missal. 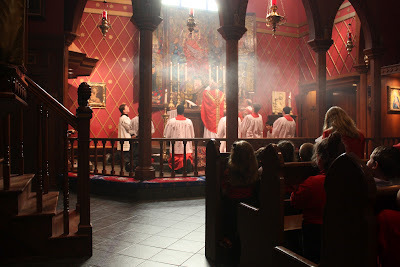 On their website, they state that it is their mission "to bear witness to the sublime beauty of the ancient Latin liturgy, to foster renewed devotion to its merits, and to aid the faithful in entering more deeply into its sacramental mysteries." Since the sacred liturgy is at the center of Catholic life, it seems fitting to have a devotional magazine focused on deepening our mystical participation in this sacramental experience... Our aim is to draw Catholics into a better understanding of the Mass as a whole and to bring about fruitful meditation and deeper devotion, as well as to educate and inform those who are new to the Extraordinary Form. Obviously since the periodical does not yet exist, I cannot offer any particular commentary upon it. However, the enterprise certainly looks interesting. Back in the summer we had mentioned a young adults retreat which was being hosted by the ICRSS in mid August. I only became aware of the fact that they have published some photos and a report from that youth retreat in late August on their website. 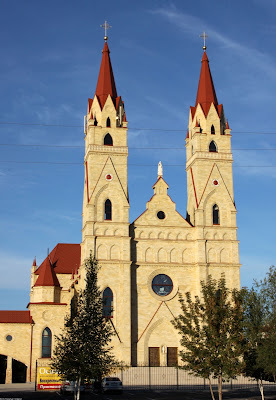 For the second summer, Sursum Corda, a young adult initiative sponsored by the Institute of Christ the King Sovereign Priest, ran on the scenic grounds of St. Francis de Sales Seminary and St. Stanislaus Oratory in Milwaukee, Wisconsin. Overlooking Lake Michigan, the long weekend featured daily Mass, Eucharistic adoration and Benediction of the Most Blessed Sacrament, spiritual talks by the Canons, a boat tour of Milwaukee, a beach volleyball tournament, square dancing and a talent show. Canons Huberfeld, Hellmann, and Jayr, along with Abbé George, were on hand to organize the event and provide spiritual direction. Sursum Corda enjoyed the return of participants from across the country and welcomed new friends as well. Since the inaugural event in July, 2011, Sursum Corda participants have regularly met up with one another for events around the country. Events include the Auriesville Pilgrimage for Restoration, the National March for Life, a winter Milwaukee retreat, and a trip to explore New York City. In the culmination of a years' worth of events, Canons Hellmann and Huberfeld explained in their spiritual conferences the importance of virtuous friendships and the necessity of striving for heroic virtue. The Catholic Artists Society will host its annual Mass for Artists at Manhattan’s Church of Our Saviour on Sunday, September 30th at 2pm. Artists, their families, patrons of the arts and friends are invited to attend. 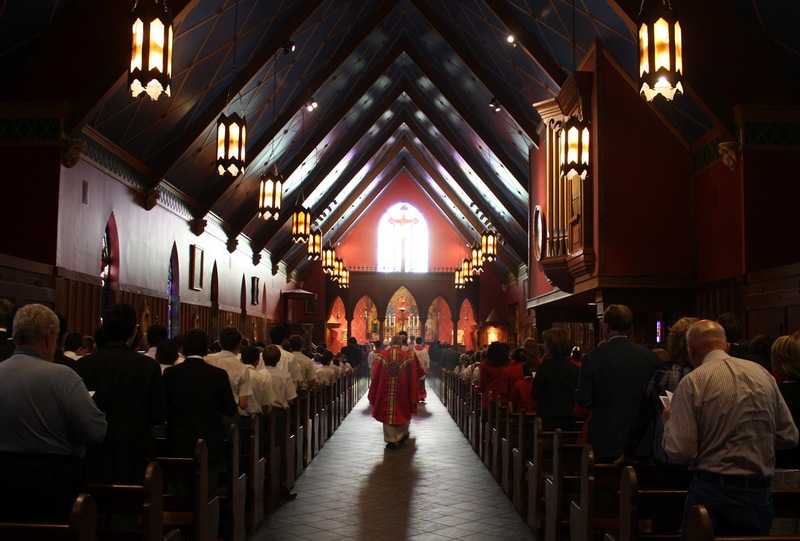 Solemn Mass in the Ordinary Form will be celebrated by Father Joseph Koterski, SJ, Associate Professor of Philosophy at Fordham University, and the editor of the International Philosophical Quarterly. Father Koterski is also one of the CAS's priestly advisors. 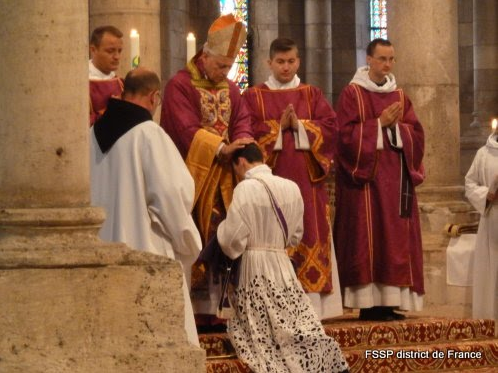 He will be assisted by Father Christopher Pollard (Diocese of Arlington, VA), and Father Justin Wylie (Archdiocese of Johannesburg, South Africa). Both Father Pollard and Father Wylie are attachés to the Permanent Observer Mission of the Holy See to the United Nations. Sacred music will be provided by a professional choir under the direction of James Wetzel, organist and music director at the Church of St. Agnes in Manhattan. The setting of the Mass will be Herbert Howells' Mass in the Dorian mode, a work of singular beauty, rarely heard in New York City. It was composed for London's Westminster Cathedral in in 1912. 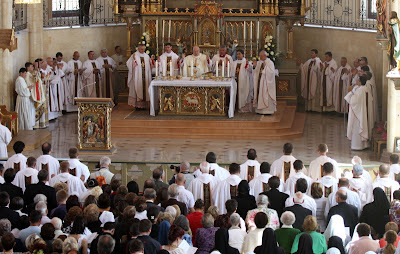 Following the mass, all are invited to a reception with refreshments. 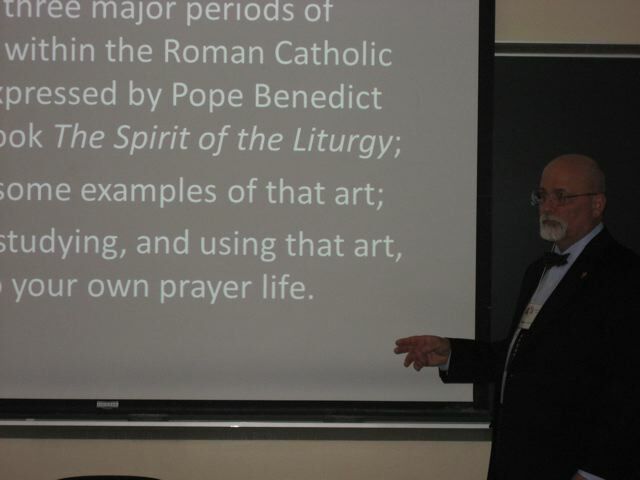 Last year's inaugural Mass and lecture attracted a large number of artists from all over the USA, and several from abroad. It is a opportunity for artists to meet one another, build friendships, and meet with patrons and friends of the arts from New York and beyond. Please RSVP for the reception, to catholicartistssociety@gmail.com. This is a worthy endeavour. Please lend them your support. NLM intends to provide some post-event coverage. 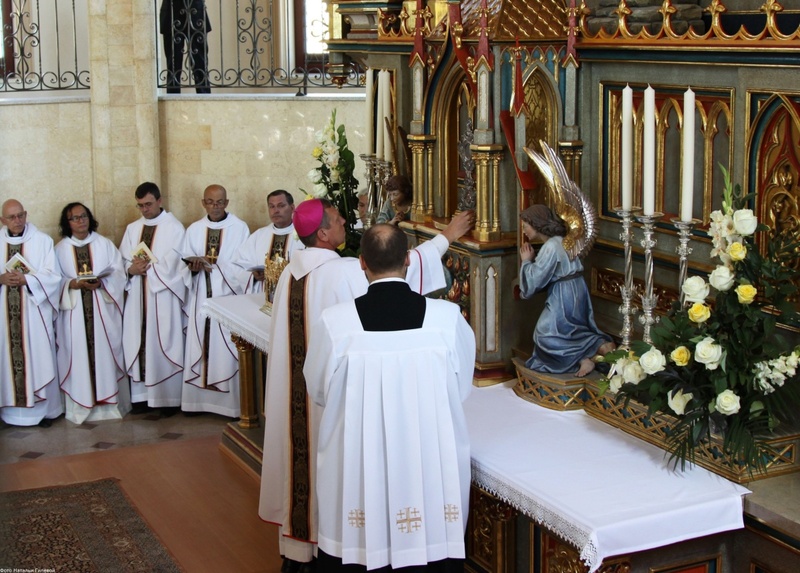 "The Musical Life and Aims of the Ordinariate of Our Lady of Walsingham"
The following paper was delivered by Msgr. 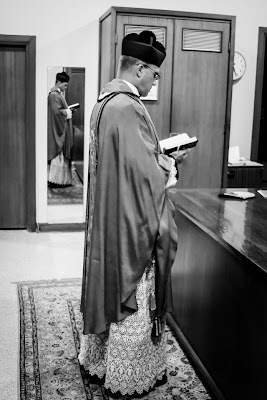 Andrew Burnham of the Personal Ordinariate of Our Lady of Walsinghma to the Blessed John Henry Newman Institute of Liturgical Music in Birmingham. The following photos were taken at the Abbey of Notre Dame de Fontgombault, showing the ordination of M. l'abbé Grégoire Villeminoz on September 22nd. 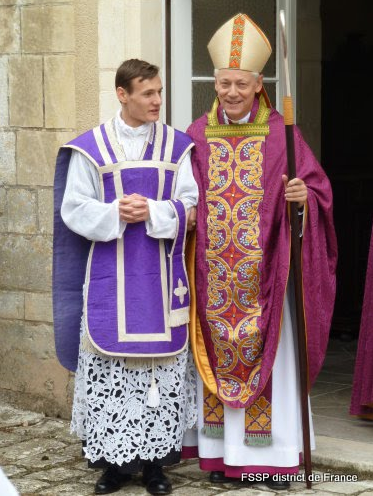 Some of you may also recognize the splendid vestments shown as the work of Dom Hans Van Der Laan, OSB which we have featured here on NLM before -- thanks to the kindness of the monks of Fontgombault. Over the years, we've spoken much about the importance of the Old Testament, biblical typology and so forth. In that regard, I was rather interested in the latest wall calendar (for 2013) which is being offered by the Eastern Orthodox publisher, Conciliar Press: Christ in the Old Testament. February—The Creation of Animals and Man. August—Moses and the Burning Bush. September—Moses, Aaron, and the Tabernacle of Witness. October—The Bronze Serpent Made by Moses. November—Jonah and the Big Fish. December—The Three Holy Youths in the Furnace. Evidently the liturgical aspect of this calendar is going to be of a Byzantine focus, though it at very least follows the Gregorian calendar. Certainly this would be a good calendar for Eastern Christian, but even for Western Christians it seems to me this might be a very nice calendar to have in your home, particularly as it might help you to both familiarize yourself moreso with Christian East, while also bringing to mind the whole matter of the Old Testament and typology. 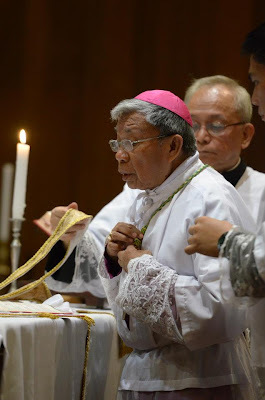 At any rate, this rather long-winded prologue intends to introduce a Pontifical Low Mass which was offered by the bishop of the Diocese of Novaliches in the Philippines, Antonio R. Tobias. 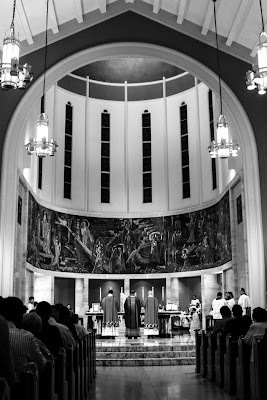 The Mass was celebrated at the Jesuit-run Ateneo de Manila University. Speaking of Masses at cathedrals to mark the motu proprio Summorum Pontificum, the following was offered at Miami's Cathedral of Saint Mary. 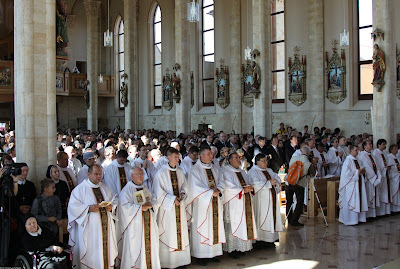 Over 300 people were in attendance, including 5 priests and 20 seminarians. 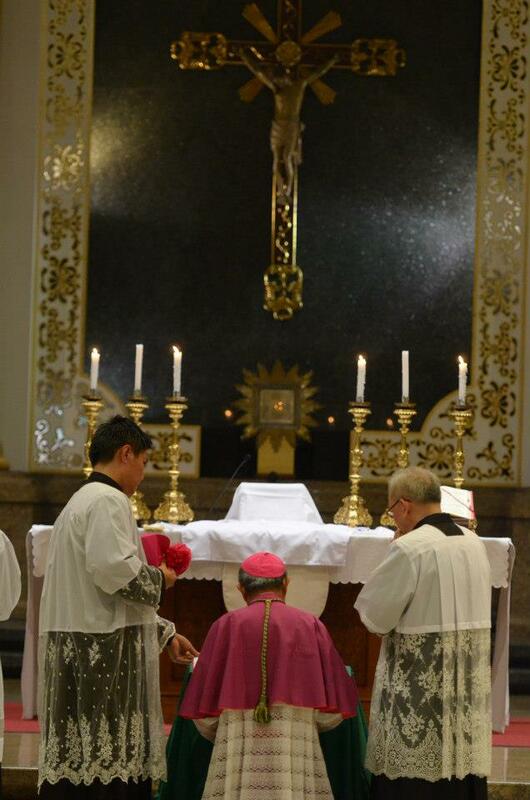 The Mass was offered by Fr. Christopher Marino. Two Masses which I wish to report coming from the same reader. 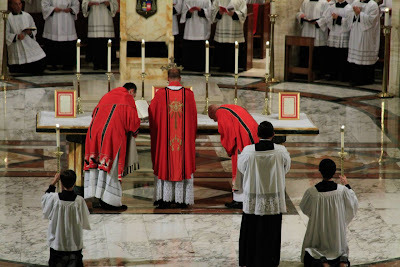 The second Mass which our reader brings to our attention happens a day later on Sunday, this time coming from St. Paul's Cathedral in Pittsburgh, celebrated by Fr. James W. Dolan for the 5th anniversary of the motu proprio Summorum Pontificum. I wanted to share the following two important pieces on sacred music with you this morning. The first is an article which appeared in the Catholic News Agency last week, the first of two parts, Rebuilding Catholic Culture: Church Music and the Fad of ‘Folk’ Style written by Sister Joan L. Roccasalvo, C.S.J. Quality is the investment of the best skill and effort to produce the finest and most admirable result possible. Its presence of absence in some degree characterizes every man-made object, service, skilled or unskilled–laying bricks, painting a picture, ironing shirts, practicing medicine, shoe making, scholarship, writing a book. You do it well or you do it half-well. Materials are sound and durable or they are sleazy. The presence or absence of quality characterizes every man-made object and service, skilled or unskilled. Quality is achieving or reaching for the highest standard as against the sloppy or fraudulent. It is honesty of purpose as against catering to cheap or sentiment. It does not allow compromise with the second-rate but reaches for the highest standards. Quality can be attained without genius (Barbara Tuchman, “The Decline of Quality,” New York Times Magazine (November 2, 1980, 38-39). Of all the prominent church figures to comment on the state of today’s church music, Benedict XVI stands out as the most articulate. Describing a philistine mentality toward sacred music, he writes: “It is strange that the postconciliar pluralism has created uniformity in one respect at least: it will not tolerate a high standard of expression” (Benedict XVI, A New Song for the Lord, 123). Read the rest over at CNA. The second article I wished to share with our readers today is actually an address give this past Saturday, Sept. 22nd to the Blessed John Henry Institute of Liturgical Music by Msgr. 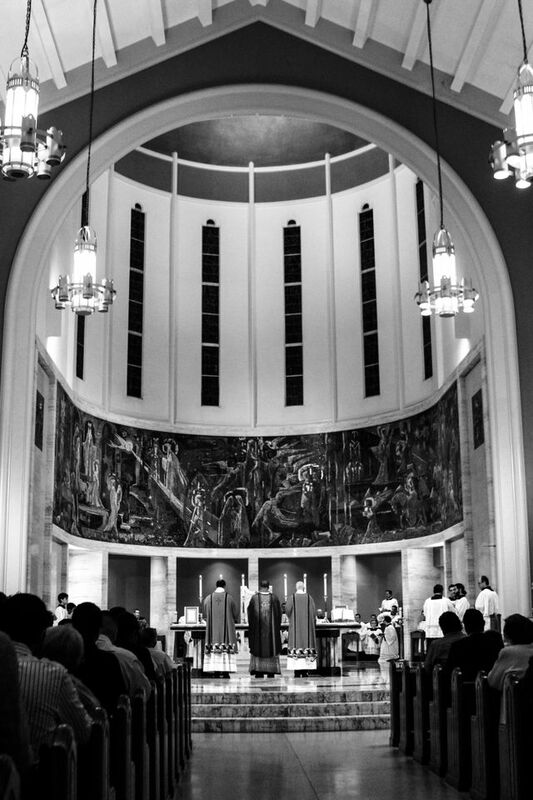 Andrew Wadsworth, the Executive Director of ICEL, Towards a New Culture in Liturgical Music. 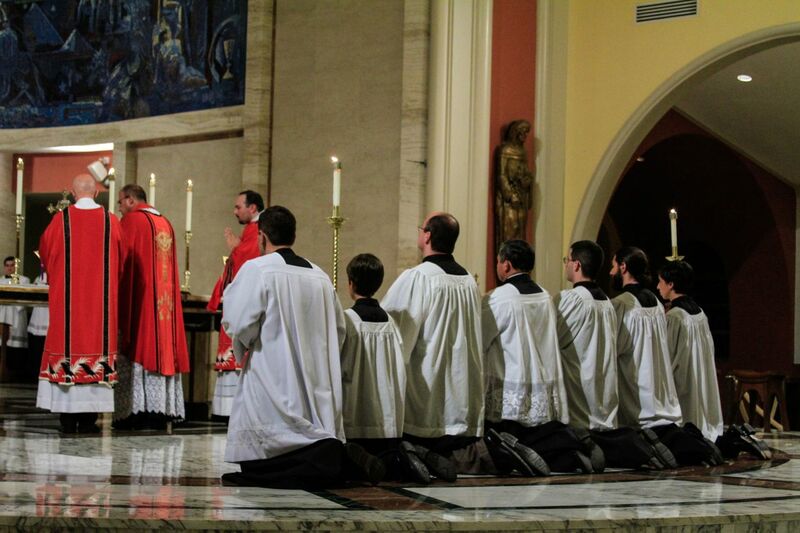 The primary and exclusive aim of the liturgy is not the expression of the individual's reverence and worship for God. It is not even concerned with the awakening, formation, and sanctification of the individual soul as such. 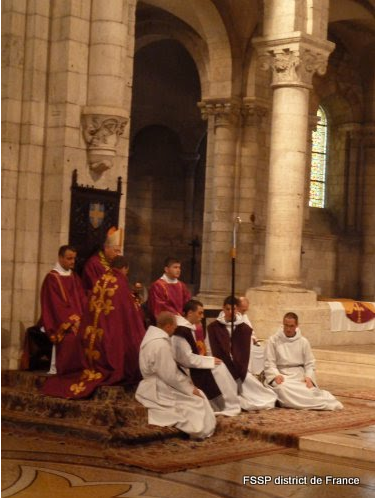 Nor does the onus of liturgical action and prayer rest with the individual. It does not even rest with the collective groups, composed of numerous individuals, who periodically achieve a limited and intermittent unity in their capacity as the congregation of a church. 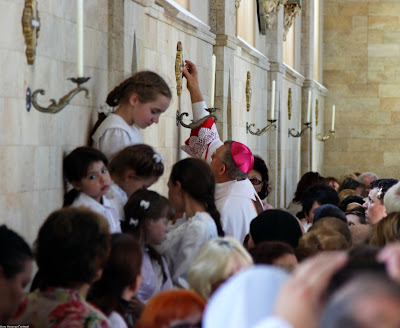 The liturgical entity consists rather of the united body of the faithful as such - the Church - a body which infinitely outnumbers the mere congregation. In starting considering the possibilities for a new culture of liturgical music, I feel we must begin by acknowledging that what Guardini stated that the liturgy is not, has in fact been precisely the experience of the vast number of Catholics worshipping in our parishes since Vatican II. 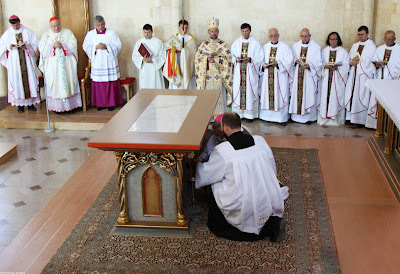 A highly anthropocentric liturgy which seems more concerned with the assembly than anything else has become the norm in many if not most places. 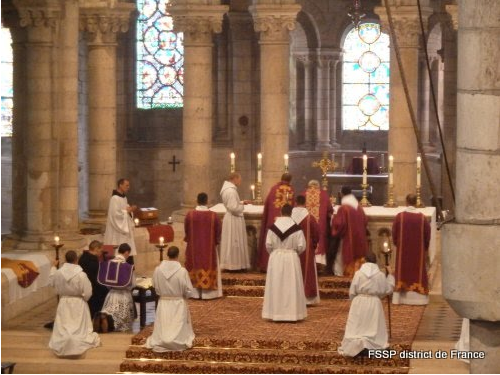 The notion that the liturgy is something we receive as a gift from God , through the Church, rather than something which we make for ourselves, has become seriously eclipsed in the minds of most Catholics. 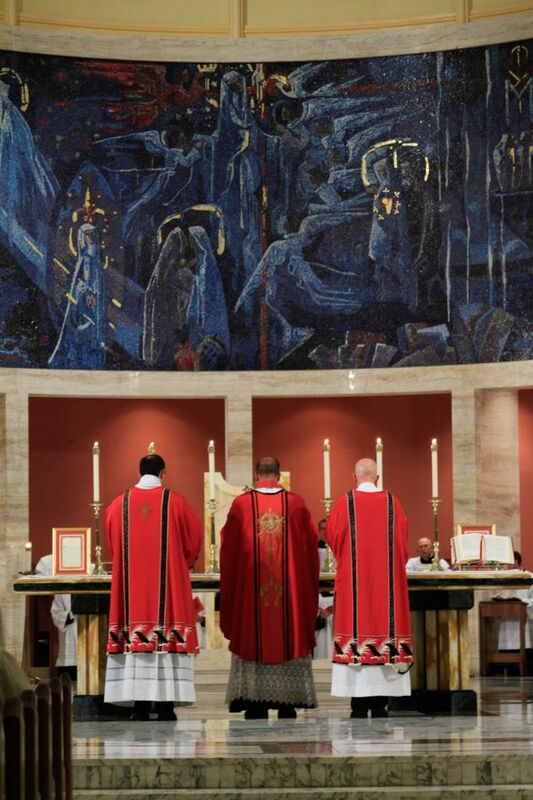 If we are to identify pointers towards a new culture of liturgical music, we must begin, like Guardini, by stating precisely what we understand the liturgy to be. Read the rest over at Chant Cafe. I was on an interview on a radio show this week, and I was struck how the debate over music at Mass rarely gets beyond what hymns we should be singing. People will fight over this subject for hours. But there is a sense in which this whole debate misses the point. We should not be arguing about which kind of devotional music to sing. We should be singing the liturgy itself. The Graduale Romanum is the source text for the ordinary and extraordinary form. 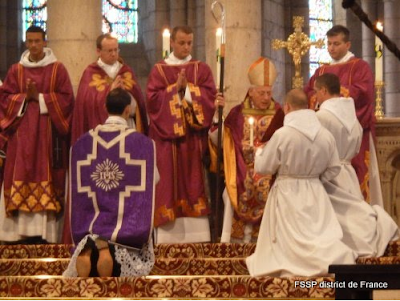 But that can be too much for starting parishes. 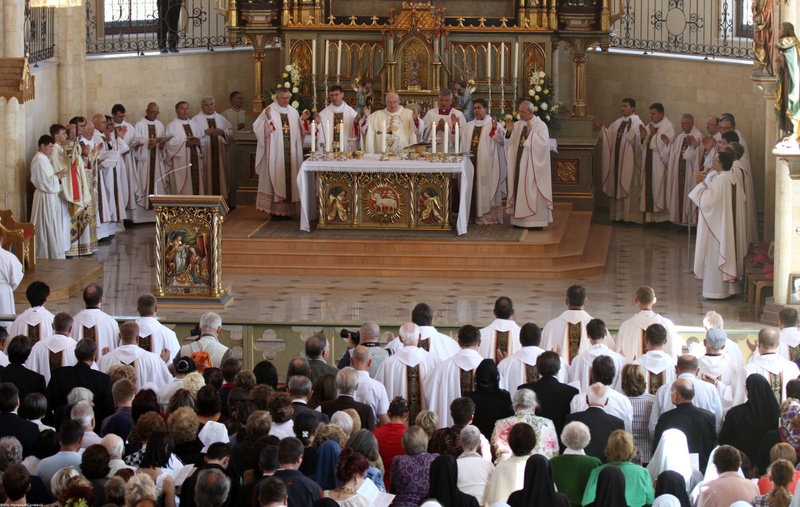 This is why we have these new resources that make singing the Mass possible for every parish. 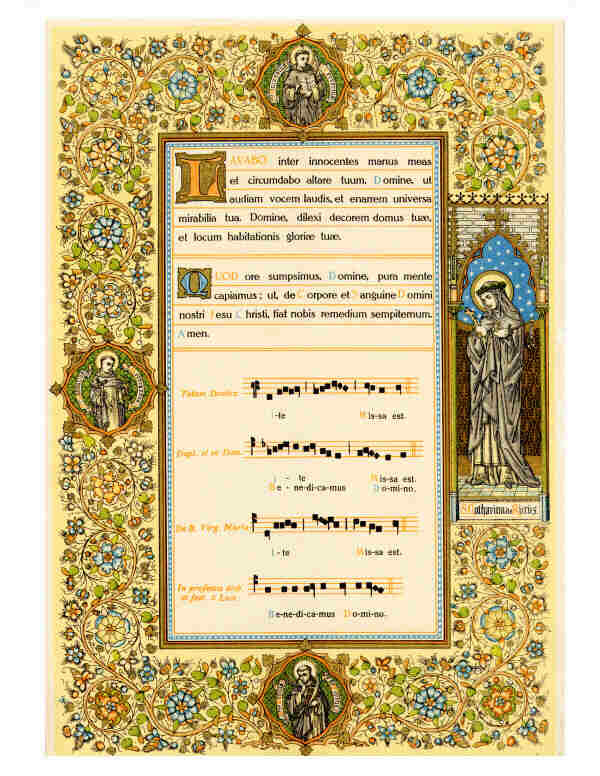 I am pleased to announce that a splendid set of early-twentieth-century Dominican Rite Altar Cards have been made available for download at Dominican Liturgy on the left sidebar under "Dominican Rite Texts -- Downloadable." These are JPG files and rather large because of the detail (the Center Card is 36 megs), so please have patience as you download them. As a preview, I have included an image of a the Lavabo Card as an example of the style. I thank Fr. Pius Pietrzyk, O.P., who prepared these images. The cards may be printed and used: there is no copyright restriction. The center card is 18 x 12"; the side cards are 9 x 6". In my opinion there are two goals for an artist who wants to make a living: first is that he creates good works of art; and second he knows how to sell it. This might seem like a statement of the obvious, but I didn't always see it that way, and when I talk to unsuccessful artists I hear many who still don't. I regularly used to complain that the culture doesn't support art, or most people have plebeian tastes and don't appreciate good art (people today get all their information from the internet and blogs for heaven's sake); or that there are no enlightened patrons around. All of this may be true (and the role of knowledgeable patrons is important ; but the question I have to ask myself as an artist is what can I do about it. Rather than expecting society to change until it demands what I am already producing, which is what I had been doing up to that point. I was forced to conclude that my success depends more on creating forms that appeal to people. Furthermore, as I wanted to be successful in creating a certain type of art, I had to work out how to do it without any compromise on the principles of tradition. The main barrier to my accepting this is my pride: if my work is not selling at high enough prices then I must accept - in this age of the internet when marketing has never been easier - that the most influential factor is that what I produce just isn't good enough. This presented me with a choice: keep complaining or strive to improve. I have chosen to follow the second option (and have much progress to make). For all this, in fact an artist can do both: improve his work and transform the society to which he aims to sell it, thereby creating a demand. The point is that means by which he will do so is the same in each case, through the creation of works of beauty. It is beauty that will change the world. So I need first to create it, and then strive to get people to see it. If people value what I produce sufficiently, then they will pay me for it. The truly beautiful will transform those who see it, and people will want it. If this is not happening, I must work harder to create something that they will value more - I must become a better artist, or a better salesman, or both. This is the principle of noble accessibility coming into consideration again. We have to create forms that are so powerfully beautiful that they connect with people today. The nature of beauty is that tends to creates the desire for it once seen. As John Paul II put it in his Letter to Artists in the context of art, beauty is the 'good made visible'. In that same letter, John Paul II was so confident in the supernatural power of beauty to do this that he called for a new epiphany of beauty. He did not appeal to society as a whole, or even the Catholic community to change itself and become more tasteful; nor did he even appeal to educators to change society so that it would appreciate good art (not that either is undesirable); but rather he addressed his call to artists. The clue is in the title of the document! It is the artist who will effect this epiphany through the creation of beautiful works of art. This, by the way directs our focus in education today. The greatest need in all the arts is for people who create beautiful work. Therefore education should be directed as much to the stimulation of creativity, as to cultivating an appreciation of what is good. Patrons have a huge part to play in the creative process and education of future patrons, lay and religious, is certainly part of this. 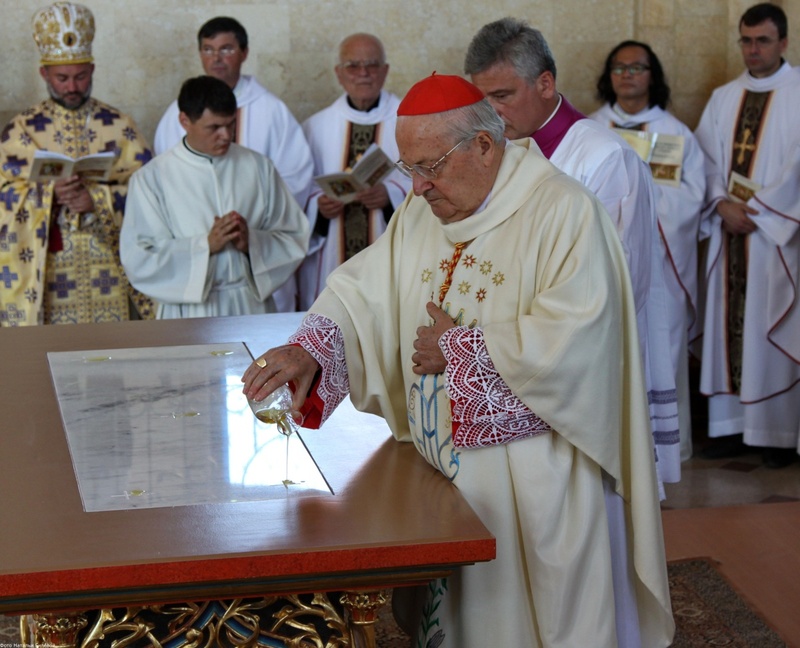 John Paul II called also for a dialogue between artists and the Church, in accord with the 7th Ecumenical Council, which stated that artists are merely executors of ideas and the ideas originate with the Fathers. Ideally, this dialogue would be a real one between the artist and living breathing Fathers. However, when an artist chooses to conform to principles of tradition, he is in connection with the Fathers of the past who directed those artists who formed the tradition. The reason that the Popes addressed the artists, I believe, is that it is the artists' responsibility to initiate this dialogue today by demonstrating that he can produce works that possess this transforming beauty. This will then draw the other parties into the dialogue. The successful Christian artists that I know who are working in traditional forms have certain things in common. Each produces work of high quality and they assume that this is the basis upon which people want to buy it. Each knows how to sell his work and each manages to support their families comfortably through their artistry. I have never heard either complain that the culture or the Church doesn't appreciate what they do. The majority of these artists have not been through any formal long term training and are mostly self taught. Regardless of how they were trained originally, the successful artists are constantly looking at new methods and materials that will help them to improve, largely teaching themselves now. And all are great students of their traditions: if there appears to be a need for innovation and there is any doubt as to its validity, they always seek advice from those who are aware of the great body of Church teaching, the theologians, philosophers and liturgists. None has a precious attitude to the craftsmanship. Making money from what they do is as important as being able to do it. This is good, I feel, for if they cannot pay the bills by doing it, then they cannot keep on doing it; but also because the market is the most efficient mechanism for the distribution of goods that we have today. Incidentally, this is something that all manufacturers might take note of. This says that if what they make is beautiful then people will be attracted to it and will pay a premium for it. The success of Apple computers is based upon this premise. Mass production doesn't need to detract from this. In fact, if an object is beautiful, then mass production means more beauty than if only a limited number are produced. I have not seen any evidence to suggest that ugliness is intrinsic to the manufacturing process. The cost of making something beautiful is not necessarily greater than the cost of making something ugly and even if it is, it is as likely to be an investment that pays off, as in the case of Apple where people will pay more for a more appealing design. The reason, I believe, that we associate mass production with ugliness is that since the rejection of tradition values in art and design, most designers simply don't know how to make something that participates in the timeless qualities of beauty. The quality of the article that is mass produced is dependent upon the quality of the original design. If the design is bad, then we have ugliness in great quantity; and if good, then it produces beauty in great quantity. And that is a desirable thing...isn't it? 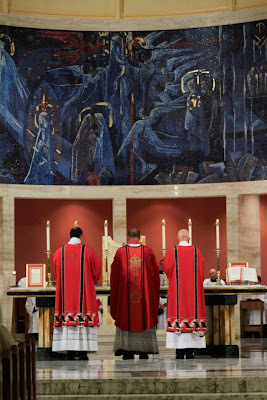 The following article is re-published courtesy of the author, Fr Thomas Crean, O.P. One of the most ancient, and most Roman, of Christian customs is to consecrate the four seasons of the year to God by special days of prayer and fasting. Officially called the Quattuor Tempora (the Four Times), and known by similar names in modern European languages, they came into English as the ‘Ember Days’; ‘ember’ apparently being what our forefathers made of tempora. How ancient are they? St Leo the Great, who ascended to the papal throne in the year 440, said that they had been instituted by the apostles. Though a certain ‘hermeneutic of suspicion’ may be slow to credit the statement, so wise a man would hardly have made it without good reason. 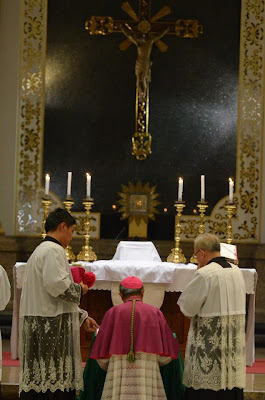 We can recall the rule given by St Robert Bellarmine for evaluating traditions: ‘that should certainly be considered to be of apostolic institution, which is held as such in those churches where there has been an unbroken succession from the time of the apostles’. That certainly applied to the Church of Rome in St Leo’s day: as it still does in ours. Pope St Callistus I (d. 222), is often mentioned in connexion with the Ember days. The Liber Pontificalis, written several centuries after his time, speaks of him as ordering seasonal fasts. A letter purportedly written by Pope Callistus to a brother bishop states that he found three of them already in existence, and simply added that of spring. The letter is considered spurious by modern scholarship; yet even if inauthentic, it could still be accurate in this regard. The Catholic Encyclopaedia (1911) considers the Ember Days to be more ancient than Callistus. After all, since the perpetual cycle of the seasons is a reflection of eternity in our world of time, it’s a natural human instinct to consecrate them by religious rites. The Romans had their feriae messis in June to ask for a bountiful harvest; their feriæ vindimiales, to pray for a good vintage in September, and in December their feriæ sementivae or ‘sowing days’. The last-named, in particular, were a time for solemn purification and earnest entreaty. So St Luke, mentioning the time in winter after which sailing becomes unsafe, speaks simply of ‘the Fast’ (Acts 27:9). Perhaps St Paul had already baptised these winter days of expiation, so that his Gentile companions, St Luke among them, were observing them in honour no longer of Ceres but of Christ. Apart from the need for Christians not to be outdone in works of penance by the Jews, St Robert gives three reasons for the observance of the Ember Days. First, they are times to thank God for the fruits of the earth and to pray for his continued blessing on his creation and our labour. Next, they are associated with the sacrament of Orders, for as St Thomas points out: ‘by fasting, men are made ready to receive sacred orders, and to confer them; and likewise the whole people are made ready, for whose benefit men are ordained.’ Finally, the Ember Days ensure that just as each year has its Lent, and each week has its Friday, so each month will have, as it were, its penitential time: for three days of penance at each of the Four Times makes twelve days, or one for each month of the year. In the Middle Ages, mystical explanations of these days abounded. William Durandus, in his vast Rational of Divine Offices, connects the physical features of the seasons with the graces that Christians should seek at these Four Times. 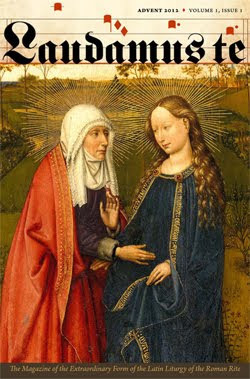 In the Ember Days of spring, we must desire that ‘the buds of virtue appear within us’; in summer, that we be fervent with the Holy Ghost; in September, we should seek to bear fruit ‘before the feast of St Michael, when the fruits are harvested’ (perhaps a reference to the archangel’s presence at the particular judgement); in winter, we should pray to become dead to the world. According to what records we have, the Ember Days spread from the diocese of Rome to the whole Western Church from the 6th Century onwards, being brought to England by St Augustine of Canterbury. Their position on the calendar fluctuated somewhat during the first millennium: in some places, the Spring days were kept in the first week of March, regardless of the dates of Lent. But all uncertainty was removed by that most vigorous of popes, St Gregory VII, who reigned from 1073 to 1085. 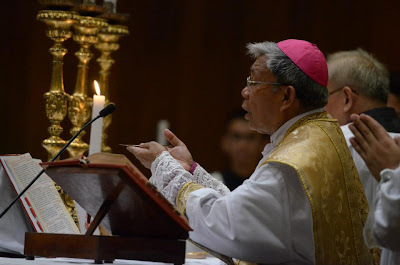 He confirmed that the Ember Days were the Wednesday, Friday and Saturday that followed four significant moments in the Church’s year: the Third Sunday of Advent, the First Sunday of Lent, Whitsunday, and the Sunday after the Exaltation of the Cross. Liturgically, their most striking feature is the addition of collects, readings and graduals. 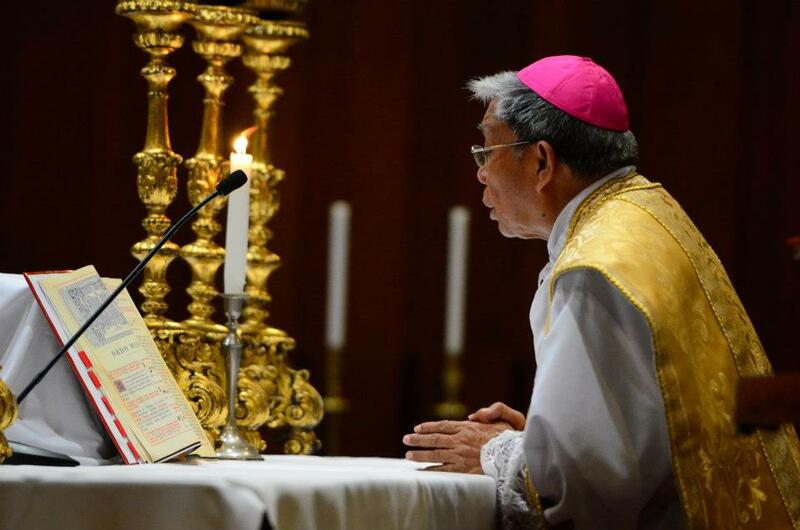 The Wednesdays have two readings, excluding the Gospel, and the Saturdays, six. 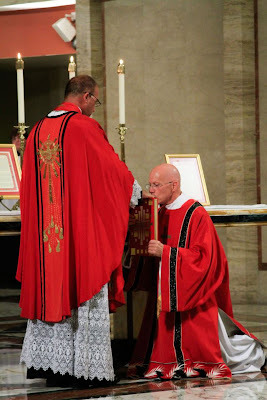 Since the gospel brings the total to seven, and the sacrament of Order is traditionally understood to have seven rungs, from door-keeper to priest, one order is supposed to be conferred with each reading. 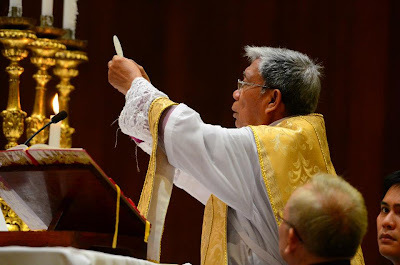 The Mass of Ember Fridays, on the other hand, resembles that of an ordinary feria: perhaps the Church presumes the faithful will in any case increase their devotions on a Friday. The 1917 Code of Canon Law and the 1962 Roman Missal preserved the privileged status of the Four Times. Canon 1006 stated that without a serious reason to the contrary, men were to be ordained only on Ember Saturdays, Holy Saturday and the Saturday before Passion Sunday (episcopal consecration was reserved for Sundays and the feasts of apostles.) Canon 1252 required fasting and abstinence on all Ember ferias. 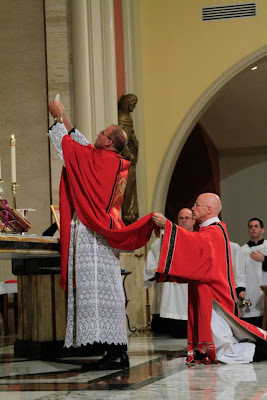 The missal preserves the traditional Masses for the twelve Ember days, though a shorter form, permitted for most low Masses, is included for Saturdays. 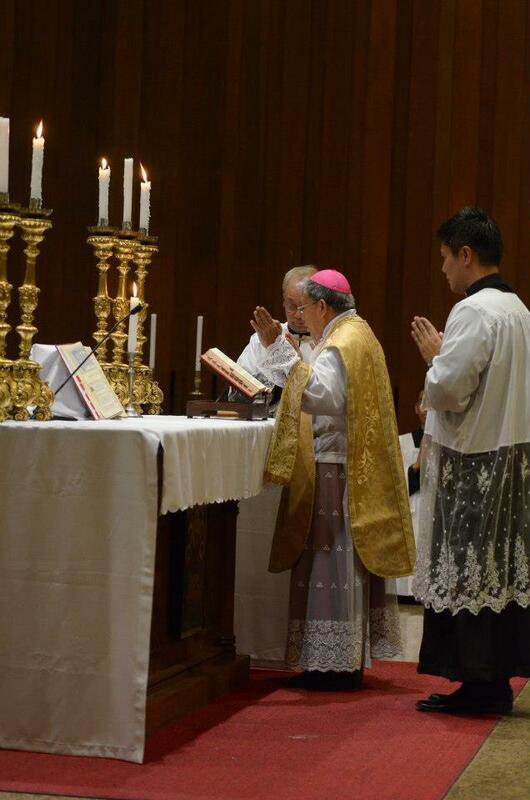 Did the post-conciliar reforms wholly abandon these venerable traditions? Not quite: Pope Paul VI, or it may be St Peter, did not permit it. 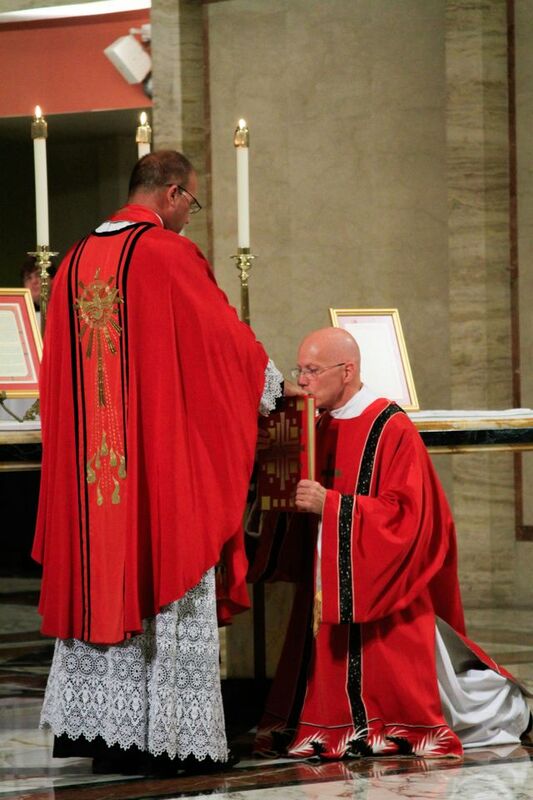 True, modern canon law is silent about the Ember Days. 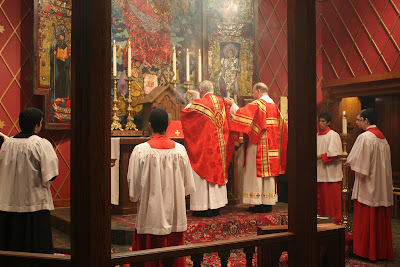 But tucked away in an obscure corner of the 1970 missal is a reference to ‘the Four Times, in which the Church is accustomed to pray to our Lord for the various needs of men, especially for the fruits of the earth and human labours, and to give him public thanks’ (Normæ Universales de Anno Liturgico, 45). The same words remain in the 3rd editio typica of this missal, published in 2002. However, the ‘adaptation’ of these days is left to Bishops’ Conferences: they can decide how many are to be observed, and when, and with what prayers. A couple of ‘fast days’ are duly marked on each year’s Ordo for the church in England and Wales, one in Lent and one in October, with the suggestion of celebrating a votive Mass of a suitable kind. The St. Louis Chapter of the Latin Liturgy Association is pleased to welcome liturgist Bishop Peter Elliot to St. Louis Saturday and Sunday, September 29th & 30th, 2012 for a public lecture and Holy Mass at Historic St. Mary of Victories Chapel downtown. 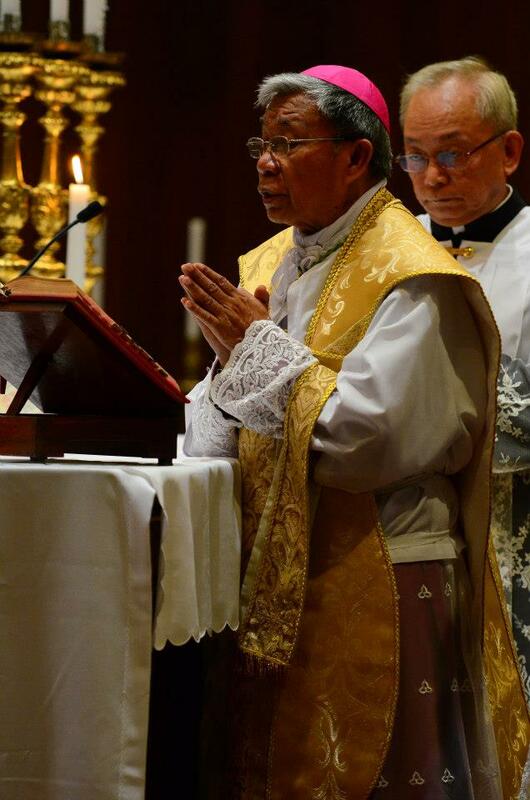 His Excellency is an international authority on liturgy, and on the Anglican Ordinariates now authorized by Pope Benedict XVI. The public is invited; free of charge. The lecture is titled “Benedict XVI and the Liturgy: Vision and Practice” and will take place Saturday evening, September 29th at 7:30 PM. Bishop Elliot will celebrate Holy Mass in the Ordinary Form in Latin at 9 AM on Sunday, September 30th. Both will take place at historic St. Mary of Victories Chapel 744 South 3rd Street, in downtown St. Louis (Map & Directions).